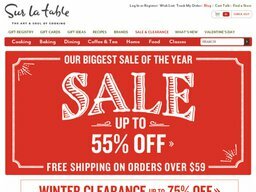 Sur La Table, meaning “on the table” in French, is an American retailer based in Seattle, Washington that sells a variety of kitchenware products, housewares, food, outdoor products and more. The company was founded in 1972 by Shirley Collins when she opened a single retail location in Pike Place Market in Seattle. The company is currently owned by Investcorp and as of 2005, it was the second largest specialty cookware retailer in the United States, just behind Williams-Sonoma. There are over 100 retail store locations in 27 states across the United States and the District of Columbia. The company also offers cooking classes in 41 of its store locations and launched a new website and gift registry program in 2011. 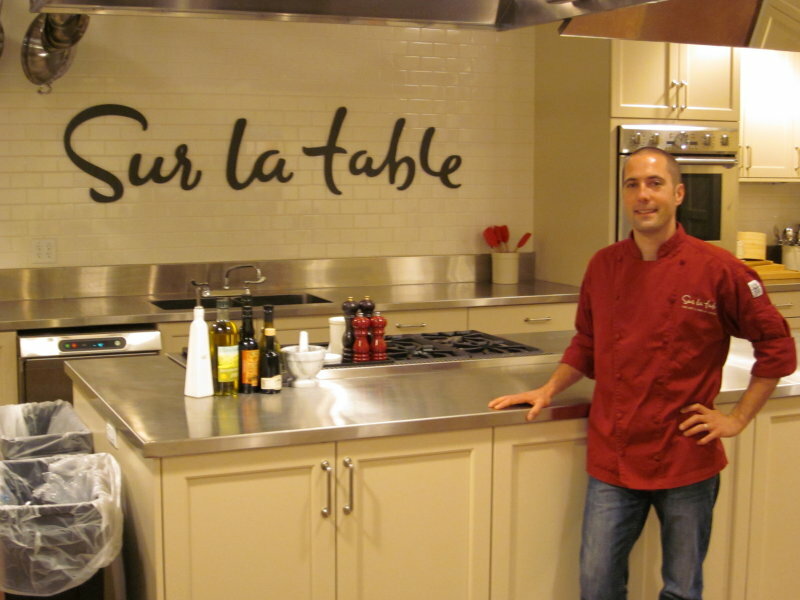 Sur La Table carries an enormous selection of cookware, dinnerware, cutlery, kitchen electrics, bakeware and so much more. Just a few of the items listed on the website include, cookware sets, dutch ovens & braisers, grill pans & griddles, grilling cookware, grills & smokers, microwave cookware, paella pans, pizza stones, pot racks, roasting pans, saucepans, sauté pans, skillets, steamers, stockpots & soup pots, tagines, woks, and specialty cookware. The knife collection is huge and includes every type of cooking knife imaginable. Knives for bread, carving, cheese, cleavers & boning knives, cutting boards, knife blocks & storage, knife sets, paring knives, etc. Small appliances offered include, blenders, juicers, food processors, grills, Panini presses, ice cream makers, mixers & attachments, pasta makers & tools, popcorn makers, pressure cookers, rice cookers, slow cookers, toasters & ovens, waffle makers, and specialty appliances. Other items include grilling tools, grills, smokers, meat, poultry, seafood, salt, spices, rubs, sauces, condiments, jam, honey, syrup, oil, vinegar, popcorn, specialty ingredients, aprons, kitchen towels, dishcloths, pot holders, oven mitts, and more. The company accepts the following forms of payment, Visa, MasterCard, American Express, and Discover. All credit cards must contain a United States billing address and transactions are completed using a secure site. PayPal is also accepted, as well as Sur La Table Gift Cards and checks and money orders based on United States funds. Sur La Table offers a variety of shipping options such as, Standard, Express and Overnight. Standard delivery will arrive to the customer in 7-10 business days regardless of when the order is placed. Express shipments take 2 business days and need to be placed before 3pm EST. Overnight packages will arrive the next business days and need to be ordered before 3pm EST. APO/FPO orders are shipped via Parcel Post and take 4-6 weeks for delivery. Sur La Table does not currently ship orders to Post Office Boxes. The company provides free shipping on orders of $59 or more and will be delivered via Standard Shipping. This is valid for single-destination shipments within the continental United States only and the customer will need to enter the Promo code SHIPFREE during the checkout process. The company guarantees the quality of products they sell and if a customer is not fully satisfied with a purchase within 60 days, they will issue a full refund in the form of the original payment. Returns must be accompanied by proof of purchase (receipt, gift receipt, etc.) and if a return is performed with a gift receipt, the refund is granted in the form of a Sur La Table Gift Card. Once the company receives returned merchandise to their warehouse, they will issue refunds within 10 business days. Refunds by check may take up to 14 business days and refunds to credit cards will show up on the customer’s billing statement in up to 2 billing cycles. @strelsert @lecreuset Hi Tracy! Please send us a private message and we will be happy to assist you with this.